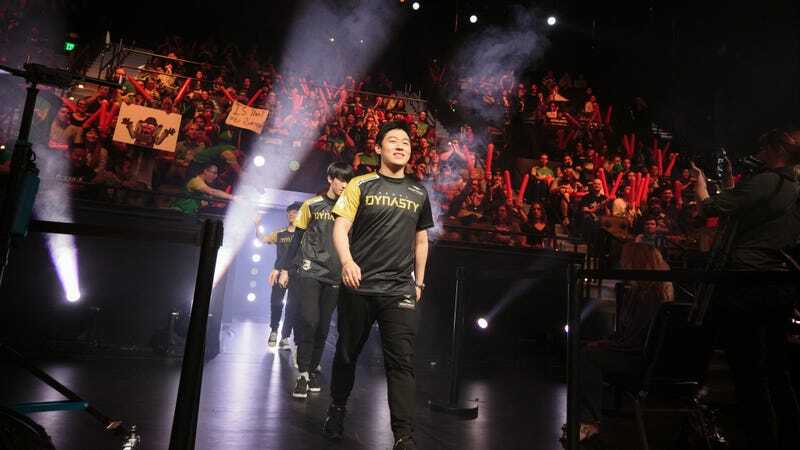 The Seoul Dynasty has had a rocky conclusion to its Overwatch League run. Despite an early start that made them look all but unstoppable, this squad has struggled in the twilight hours of stage 1. And while it started to recover and look more like itself against San Francisco last night, it was too late to salvage the Dynasty’s playoff hopes. Each of the four stages of the Overwatch League’s inaugural season culminates in a playoff title match, determining the overall winner of the stage and awarding a cash bonus. Seoul’s recent struggles meant that while its record was comparable to teams like Houston or Boston, its map differential—used for tiebreakers when teams have the same win-loss record—was notably lower. To stay in the conversation, Seoul needed to not only beat the Shock, but not drop a single map in the process. San Francisco didn’t wait long to strike the mortal blow. On map 2, the Shock established a defense that Seoul couldn’t seem to break. Switching sides, the Shock only had to take the first point to end it, and they did just that. In less than 10 minutes, the Dynasty’s playoff hopes were spoiled. To rub salt in the wound, the series went the full distance to 3-2, with the Dynasty achieving a bittersweet victory. There are a lot of reasons you could attribute to Seoul’s tumble from grace. Maybe an over-dependence on key players like Kim “Fleta” Byung-sun and Ryu “Ryujehong” Je-hong to show up every game, messy dives, or just being on top long enough that other teams know your playbook all too well. There’s certainly credit to be given to the Shock as well, as Andrej “babybay” Francisty had a great night. I keep coming back to Houston Outlaws’ coach Kim “TaiRong” Tae-yeong’s thoughts on the Dynasty, posted and translated on Twitter. Once a team has reached the top, time and environment are not their friends. Newcomers adapt while the top teams have to innovate or get swallowed up. Seoul will have a lot to work on and tinker with in for the next stage. Make no mistake, this is a good team—but if anything, stage 1 has shown that the former Lunatic-Hai is not unbeatable. The race for the playoffs, however, looks all the more interesting thanks to the Shock’s toppling of Seoul. Five teams remain to fill the three spots: The New York Excelsior, London Spitfire, Houston Outlaws, Boston Uprising, and Los Angeles Valiant. Two games today will determine who competes tonight in the playoffs. A top of the ranking match-up between New York and London, and a scrap between two of the teams still in the hunt, Houston and Boston. If you want to see the full graph breakdown, Reddit user StrictScrutiny put together a really handy table that you should check out. The final regular matches for stage 1 of the Overwatch League kick off today at 2 p.m. ET with New York vs. London, over at the Overwatch League Twitch channel.